Welcome to the House of Etiquette, for a modern-day wedding experience with an Oriental touch. 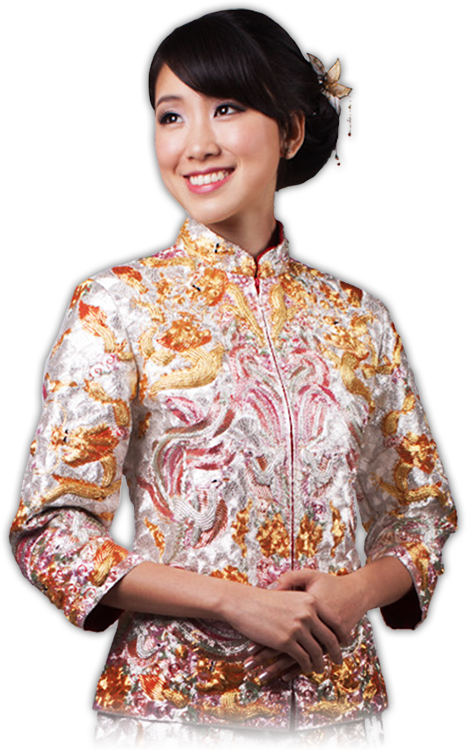 Step right in, and check out our range of the highest quality Qun Kua, or traditional Chinese ceremonial ensemble, with their unique, elaborate designs and perfect cut. Our exquisite ready-to-wear bridal collection featuring designs inspired by the glamour of Shanghai during its heydays in the 1920s, also promises to draw out the feminine elegance in every bride. Or, enquire about our made-to-measure service for a Qun Kua, wedding or evening gown, specially customised to suit you uniquely. Whilst you are at it, don’t forget to browse our online shop and order your essentials for the Chinese ceremonial customs at the click of a button.